The Sibling Project is run monthly and encourages you to take photos of your children together. I love seeing these each month and have the entries have really inspired myself to take part. I originally wanted my new camera for vlogging, but have recently found myself wanting to try and improve my photography skills. I originally was planning a photoshoot outside last Saturday doing a fun family filled activity. But thanks to Rowan having a cold, we were struck down by his germs and have been full of cold all of the weekend. Sunday night, I was finally feeling a little better and decided to have a go at trying to take some photos and I am so glad I did. Josie has been desperate to be twinning with Rowan and was over the moon when I found these tops in H&M. I loved the idea behind The Sibling Project as it makes you take the time out of busy schedules and come together to make happy memories and documenting this. We done our photoshoot in the comfort of our home and trying out mummy’s new photography lights and the kids absolutely loved this. You can see by the photos above that Rowan kept getting the giggles. The only issue during our shoot is Josie is so tall considering she is only eight years old. So trying to get a picture of them together can be tricky. Below is my favourite photo from the shoot. Funnily enough it wasn’t even going to be a main picture. It was one of those where you go click happy and hope for the best. I love the lighting especially in this photo and the kids look absolutely adorable Even though Rowan is looking away in the picture, this is certainly my most favourite picture. 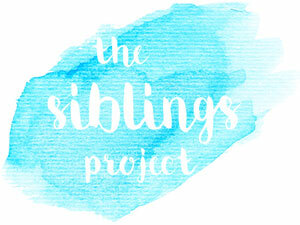 I am glad I have took part in The Siblings Project and encourage you too. It makes you take those photos that you have been meaning to take. I am already looking forward to the next one. The photos are just gorgeous! Love their matching jumpers! They are both such cuties! I love these jumpers! This is such a lovely idea for a project, and as you say, great motivation for taking photos you might not usually take! Can’t wait to see the next post! Beautiful photos Stacey, I struggle to take photos of the boys just on my phone lol hopefully one day I’ll get them to sit and enjoy having their photo taken together!